Tucker's Point Club is Bermuda's newest luxury resort and private club. It was formerly known as the Castle Harbour Golf Club, which dated back to the 1930s. The Castle Harbour course was built by Charles Banks (on a site adjacent to the Mid Ocean Club) and it was a Bermudan favourite, possessing the most stunning opening and closing holes and blind shots aplenty. .
Gone has the old hotel and the old Banks course too. In its place a 2002 layout designed by Roger Rulewich (an architect from the Robert Trent Jones stable). The original opener is now the 17th and the original home hole, which has been changed beyond recognition, is now the 11th. "Built from the remains of the old Castle Harbour course, Tucker's Point has languished due to the decline of the island as a resort destination." Commented Tom Doak in The Confidential Guide to Golf Courses. "The property is too hilly and severe, with a number of blind doglegs and forced lay ups off the tee. The theft of Castle Harbour's iconic 2nd fairway for a handful of mega-mansions shows where the developers' true motives lay." Tucker’s Point Golf Club was originally designed by Charles H. Banks in 1932 however this 18-hole par 70 course has gone through numerous modifications over the years. In 2002 Robert Rulewich, the former chief designer for Robert Trent Jones, again revamped this course and replaced the greens with TifEagle Bermuda grass to make them faster but kept the challenging elevation changes that it was most famous for. The black tees are just a little under 6,500 yards but with a course rating of 72.1 and a slope of 134, I would highly recommend you swallow your pride and move up a set of tees since accuracy is much more important than distance on this course. The 13th and 17th are their signature holes. #13 offers a panoramic view of the entire north coast and west end of the island while #17 has sweeping views of Tucker’s Town and Castle Island. You will find that the greens are large, the course is well manicured and offers stunning views of the turquoise sea. This is a private course but allow visitors to reserve a tee time a minimum of 48 hours in advance. 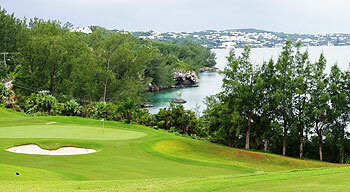 Of Bermuda’s three main golfing attractions, Tucker’s Point is the most “exclusive”. Set in a wonderful property on the shores of Castle Harbour, it’s now the centrepiece of a hotel and residential complex that makes the word “exclusive” itself downmarket! Originally part of the old Castle Harbour Hotel, it was completely made-over about ten years ago and reopened for business early this century. Initially the community built around its fairways was tastefully done with little encroachment into the golf course, but, of course, Mammon cannot be stayed, and now in several areas the intrusion is major, and underwhelming; and the owners are seeking permission to build even more, rumour has it. As one would expect a walk-on pays through the nose to enjoy the course and its magnificently appointed, if rather domineering clubhouse, which has all the high-end American superior country club accessories – excellent dining room and cuisine, good bar, glorious views and even a card room, for God’s sake. There is a membership in the club for those who have a lot of money to spare, but there is no club spirit – let there be no mistake this is a business first and foremost. I don’t think there’ll be much change out of $350 for a round including a cart (which is necessary given the terrain and the heat and humidity, but not mandatory). You need an introduction to play, although these are readily available from the Island’s hotels. As one might expect the service and staff quality is far ahead of anything else available at any other golf club (indeed establishment) in Bermuda – and the support staff who get you set up and off to play are second to none anywhere – great guys. The course itself is a disappointment – not for lack of care or want of expenditure. It is extremely hilly, and there is little natural turf. Consequently in many places the grass is thin and unbound into the soil, and this is exacerbated by the run-off of rain from the steep hills, which seems to sweep the undersoil away, and leave the fairways rather bare. You feel this when you hit a shot off of it – somehow the contact isn’t right even on good shots. The greens are usually terrific. The design is dictated by the terrain and there’s little remarkable in a positive sense. The 6th and 13th are the best holes, but it really does seem unnecessary to have two near identical par 5’s parallel side by side in the 7th and 15th. The 8th is I think the worst and most poorly designed short hole I have ever played. Scenically the back nine is outstanding, magnificent. The glory used to start at the short 11th but that hole’s views have been ruined by the building of the new hotel and an apartment block. The long climbs from the 11th and 12th greens to the 12th and 13th tees respectively (I did mention you need a cart – these climbs are heart-attack inducing in the heat and middle-age!) are rewarded by panoramic views of the whole island, looking westward. Both holes are into the prevailing usually brisk to fierce winds, with the 13th from the back tee setting up a most interesting and tight drive to a narrowing fairway – a very nice hole. The 17th is a driveable par 4 (300 yards) from a very high vantage point that offers stunning easterly views – this used to be the Bermuda golf promotional vista before Port Royal’s 16th was created. The 18th tee is down in proximity to the ocean, a very peaceful spot. Funnily enough, like all Bermuda’s golf premier courses TPC is parkland and the ocean never comes into play. In nice weather you’ll have a most pleasant day at TPC, and although you’ll be poorer (but you shouldn’t play this course if that bothers you), you’ll carry away the memory of the truly magnificent vistas. But if you are a serious golfer you won’t remember it as a golfing thrill. Be warned though, the pace of play is atrocious – patrons didn’t pay all that money to hurry or fret about holding anyone else up. Budget a minimum of five and half hours if the course is busy. A lavishly exclusive club where the likes of Michael Douglas and Catherine Zeta Jones are members, we only managed to get a tee time through a friend's friend, who is a member. As soon as you arrive you know that you are at a special course. The green fees are pretty steep but the golf course is kept in excellent condition. What wasn't good was that we get stuck behind some hackers which meant waiting on some tees, but I guess when you are in the surroundings of Tucker's Town this is not too much of a problem. The club house and changing rooms are beautiful and the food good too. As far as value for money and the course is concerned I prefer Port Royal but if you have the available 'readies' then for the lavishing surrounding alone it is worth a play.